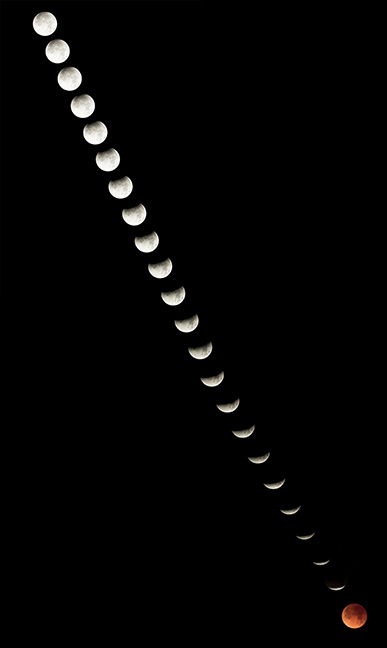 This 23-photo composite shows the path and stages of the total eclipse of the Super Blue Blood Moon as seen in Tucson, AZ on January 31, 2018. The Penumbral Eclipse began at 3:31 a.m., the Partial Eclipse at 4:48 a.m. and the Total Eclipse at 5:51 a.m. Photographs were taken at 3:30 intervals. The eclipse was the first to coincide with a Blue Moon in North America in more than 150 years.